SnapCut works with Universal Robots' e-Series line of cobots and easily cuts shapes in 3-dimensional steel components. SnapCut allows non-welders and non-robot operators to easily cut shapes into three dimensional, structural-steel components. 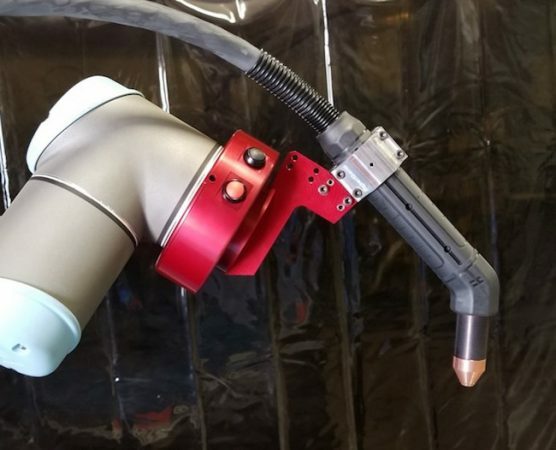 SnapCut utilizes the UR collaborative robot to manipulate a Hypertherm cutting torch to the desired positions around the cutting path. Included in the SnapCut software are standard shapes like squares, rectangles, circles, or C-channels that can be selected for parametric programming. The operator will simply move the cutting torch to a few locations on the cutting surface, hit run, and watch the sparks fly. If you need a non-standard shape, you can program it yourself and insert the SnapCut instructions for cutting control or have Arc Specialties add the shape to the parametric programming interface.